1863 was the year before civil registrations became compulsory for all in Ireland on the 1 January 1864 (there were civil marriage records from 1 April 1845 for non-Catholic Christian and Jewish marriages but these did not include Roman Catholics marriages). All marriages at this time were recorded in the parish church in which the marriage took place. Occasionally these weddings were also announced in the local press. 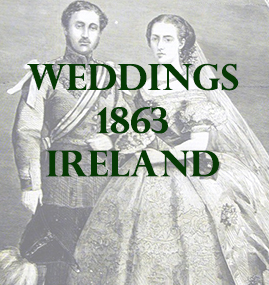 The following weddings all took place in Ireland in 1863 and were announced in the Limerick Chronicle. The Limerick Chronicle, as with other newspapers of its period, carried news weddings. It was quite expensive to place a wedding announcement into the papers and as such it was not common practice for those on lower incomes. It was noticed that although the marriages may have taken place in one county, the bride and groom may have been from different counties, so the weddings are sorted into the sections for each county mentioned in the report. The dates given match the date the Limerick Chronicle was issued. The names of both spouses have been extracted from the reports and the original reports are beneath those names. Click on each county to discover whose wedding was recorded in the local press.